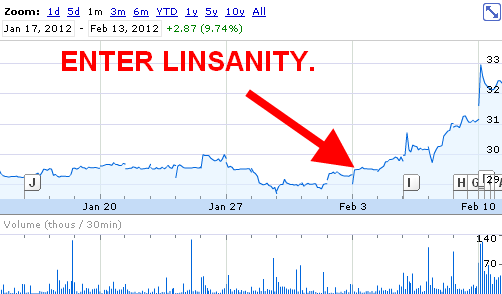 Looks as though the last year of the Lin-sane contract (3years/$25mil) would have been cheaper to pay for being over the lulxury tax, then to take such a hit the day after Lin exits for Houston! MSG takes a $300,000,000 loss the day after the Knicks decide to let Lin mozzy on down to Houston. Well Dolan I hope it is all worth it. Can I say that Dolan’s ego is not priceless anymore? It seems as though it’s worth $300mil at least. 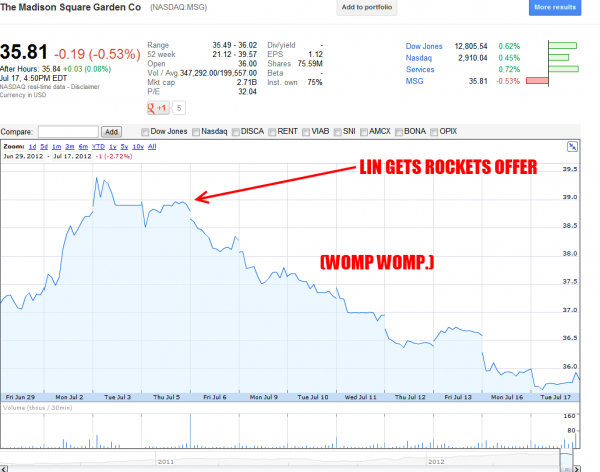 You can take a look at the chart above and see what Impact Lin had on MSG’s Stock when Linsanity was in full bloom and below you see the crash.